2010 Rieju MRT Pro 50. Picture credits - Rieju. Submit more pictures. 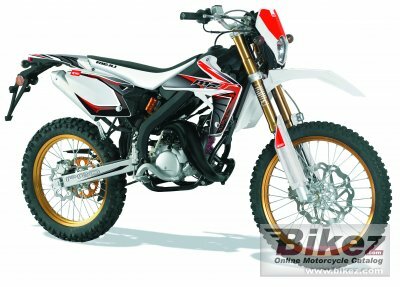 Based on the MRT 50, the Pro version boasts Galfer wave disc brakes (300/200mm) with 2-piston callipers, Marzocchi 40mm inverted forks, gas rear shock absorber combined with progressive rear suspension to further improve the handling. The Mineralli AM6 engine is fitted with a modified cylinder head for increased power capabilities. Front suspension: Marzocchi inverted fork of �40mm. Front brakes: Single disc. 2-piston. Galfer Wave. Rear brakes: Single disc. Galfer Wave. Ask questions Join the 10 Rieju MRT Pro 50 discussion group or the general Rieju discussion group. Bikez has discussion forums for every moped. View comments, questions and answers at the 2010 Rieju MRT Pro 50 discussion group. You can sign up for e-mail notifications when other riders answer you. If you have extensive experience with the MC, please send us a review. If you consider buying this bike, you should view the list of related motorbikes Look at photos. Compare technical specs. And check out the rating of the moped's engine performance, reliability, repair costs, etc. You can compare the rating with other bikes.